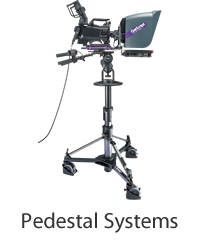 What is most expected of a remote head is to perfectly perform your camerawork just as you intend on remote operation. 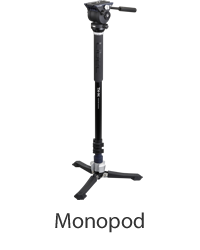 The REMO30 is a high-grade remote head that exceeds your expectations. It is equipped with a unique drive system that transmits motor power accuracy. 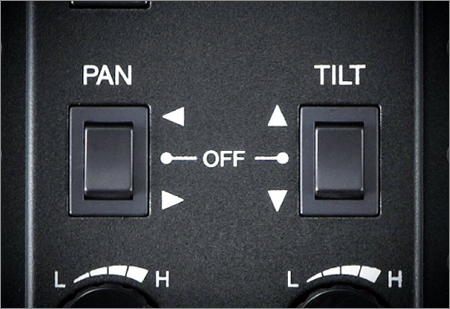 Every movement can be traced at an ideal speed: pan, tilt, and also diagonal movement which is achieved by combining the power of pan and tilt motors. The REMO30 is splash proof, (meets IPX2 standards), it can tolerate outdoor shootings under severe climate conditions. 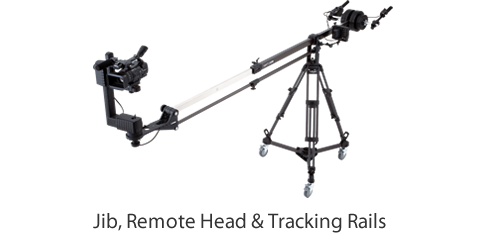 The REMO30 is an universal remote head, it can be used with other equipment such as tripods and jib arms you already own. You can also enhance your convinience with various optional products, I.e. 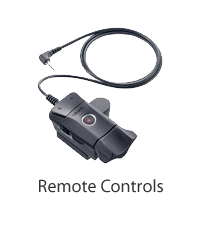 control unit CU30 which allows a more efficient remote operation, zoom & focus control ZFC-L available for LANC*(Sony/Canon) cameras, and other items. When mounted upside down, you can achieve a complete bird's-eye shot. Available for both 75mm and 100mm types. 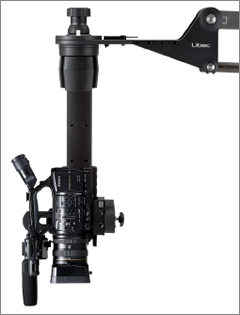 It mounts on nearly any 75mm/100mm jib arms and tripods. The REMO30 ensures a perfect camera balance. This prevents motor and drive stalling during tilt movements. Instead, it offers smooth camerawork at all times. 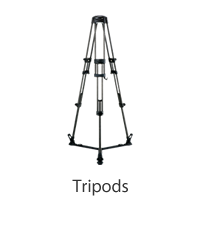 Equipped with a 80mm/3.0" sliding adapter plate, which aids back and forth balancing of a camera. 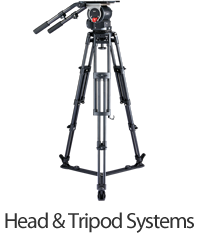 For center of gravity positioning, fine tune adjustments can be achieved with the tilt arm at 90 degrees. Cable can be routed through the cable leads to prevent tangling, which offers a comfortable operation. 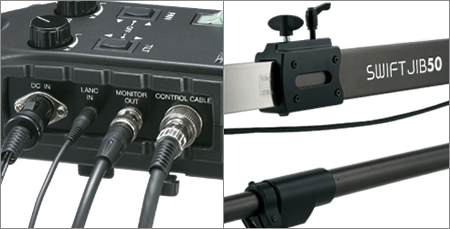 Pan & tilt control, LANC, and monitor cables are combined in a single control cable. 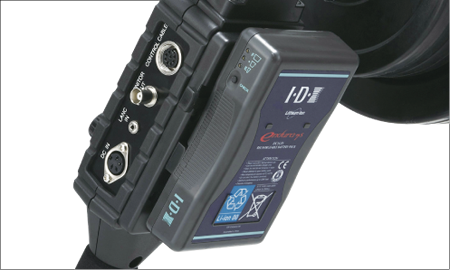 When the CONTROL CABLE is used for monitor output with HD-SDI cable, noise and image interruption symptoms may occur. 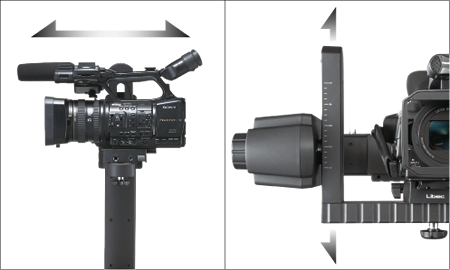 In case of HD-SDI output usage, please connect HD-SDI BNC coaxial cable from the camera to the monitor separately. 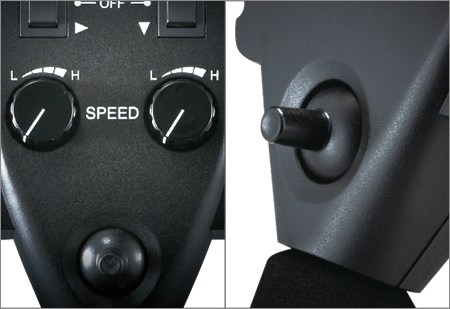 An infinite variable speed control can be achieved by operating the joystick and pan & tilt speed control dials. 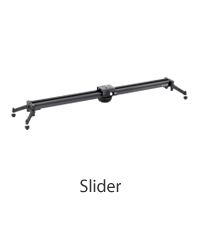 Equipped with a lock system that can stop either pan or tilt motions. 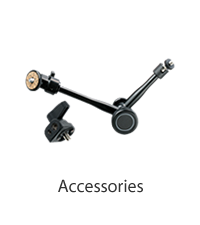 This enables you to focus on a single direction for an accurate operation. 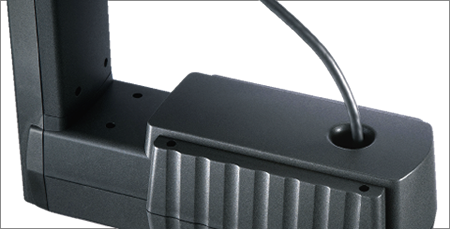 The V-mount battery is attachable to the back side of the back side of the control box. 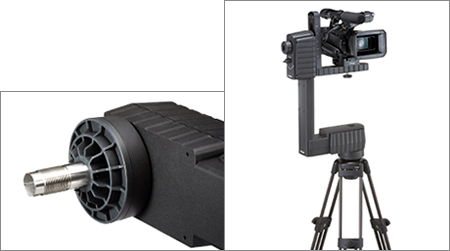 A variety of cables and adapters are bundled to accommodate every shooting conditions and use of camera types.